Business Data Analytics can help most any business more effectively reach goals and objectives. Whether a new or established business, serving a county or national market, similar tools and methods apply. See related Web version for more details. • How can you examine patterns/characteristics of existing customers? • Where are prospective customers and possible unknown opportunities? • How do you best define your market area? – what geographies have the largest number of prospects? • What are the sales potential in this market area? – what are the best measures to examine sales potential? • What is your competitive position? – how many other establishments offer a similar service in your market area? • How can your sales data identify geographic areas of opportunity? Tools and methods described here can help answer these questions and facilitate strategic planning. Here are key steps to using Business Data Analytics in your business. 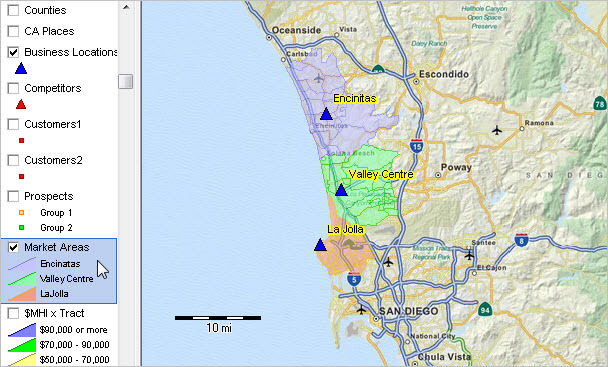 These applications make use of a GIS project and data for a business located in the San Diego area. Click link to view graphics. 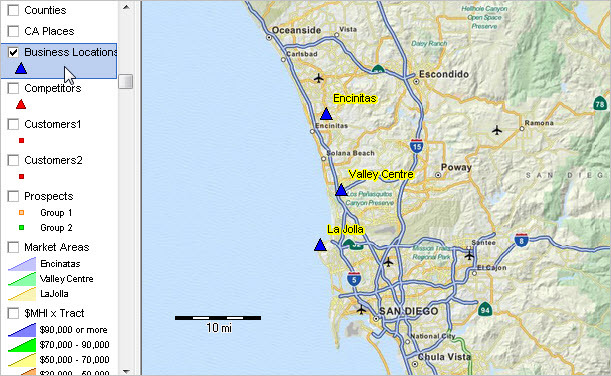 Blue triangle markers show existing locations. Are these the ideal locations? What territories do locations serve? Are they developed correctly? Territories for service/market areas are shown as color-shaded areas. What are the market characteristics? Urban census blocks are shown with an orange fill pattern. – examine scope of urban areas and how they relate to business development. Census tract population is shown as a label for all tracts. 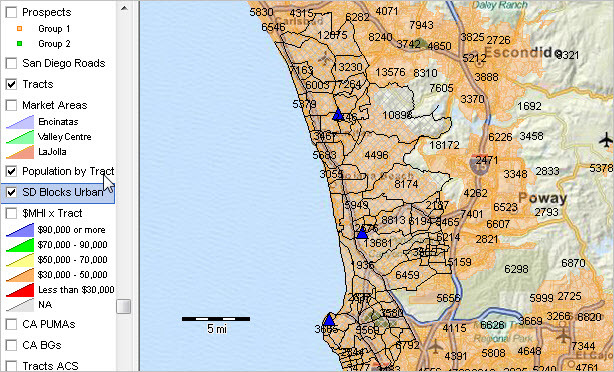 – identify population concentrations/attributes for small areas. 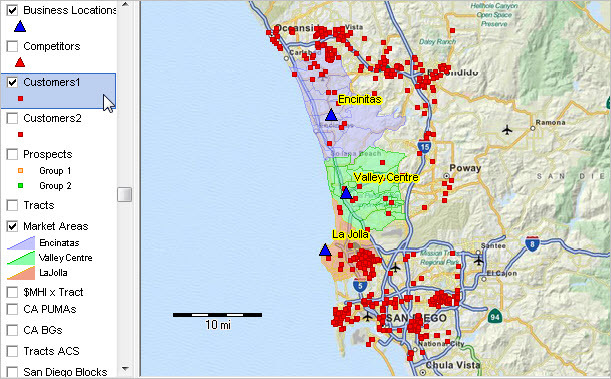 Red markers show existing customers. 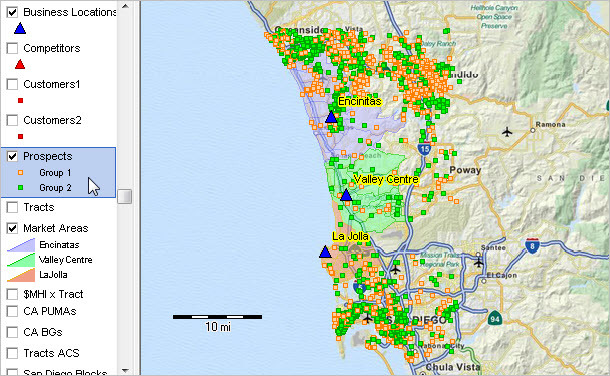 Orange and green markers show prospects based on different sources/criteria. What is the competitive position/where are competitors located? 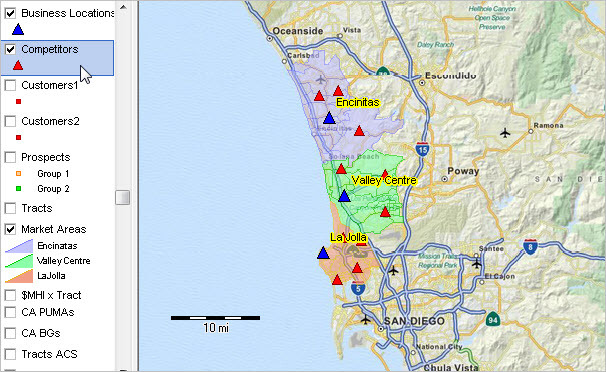 Red triangle markers show where competitors are located. Graphic shows zoom-in to Encinatas location with all features shown separately in above views. Roads/streets have been added; optionally use for routing and locational analysis. These extended topics make use of the data and analyses reviewed above. These topics will be covered in subsequent sections. • Examining financial situation and outlook? – how might things change, when where and how? 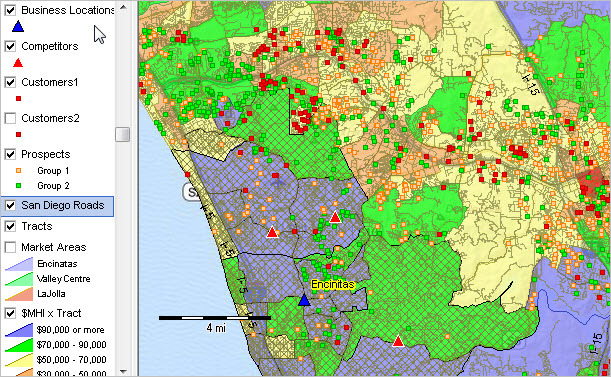 This entry was posted in Block Groups, Census 2010, Census Blocks, Census Bureau, Census Tracts, Maps, Patterns, Urban and tagged business data analytics, census blocks, data analytics, geospatial analysis, GIS, market research, sales territories, San Diego, TIGER shapefiles, urban population. Bookmark the permalink.